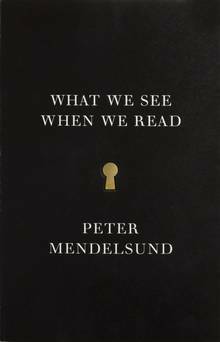 It makes sense then that What We See When We Read comes across as a crafted, multi-sensory experience. The subject matter is ‘narrative’… both from a reading and a having-been-written perspective—how narrative is displayed, how it enters our eyes and our minds, what stays with us and why; what we look for, what we find, what we can expect from the writer, and what’s down to the reader. The paragraphs are bite-sized and pages often contain acres of white space (or, alternatively, are almost entirely black), with only a few bullet points or a single word. Mendelsund’s use of a visual arch, with reference to an actual arch, to show the theory of narrative arc… is typical of how this book is constructed: he not only explains how we read and what we see while we do it, but he has us walking through the experience at the same time. An obvious move of course, but it takes a minute to realize exactly how it all works and to just relax with it. While both aspects of What We See When We Read are equal and both can be seen as simplistic or as layered as you like, I found myself becoming frustrated with the choice, as if I was being asked to read/experience two different books. This may be part of the overall plan to illustrate the reading/visual experience but I find it a tad too much of a muchness, a few too many graphics and ‘design’ elements that begin to have the opposite effect of what they’re intended for—they become less illustrative and more overload of the same multi-senses (which then begin to tune out simultaneously). For that reason best consumed, perhaps, by dipping into now and again, enjoying bits at a time instead of reading straight through. Bottom line: despite its pleasures, at 417 pages, it feels a little over-done. That aside, I can see this as a good book club choice. In which case, some knowledge of Anna Karenina and a few other classics would be helpful (various narrative devices are highlighted with examples from a number of books you thought you’d read but actually never have). Helpful but not necessary. In fact, a book club might be the ideal way to savour it. Whereas the pleasure of some books is not enhanced through sharing, especially with people who see it very differently (read: one person’s exhileration is another person’s sleeping pill), What We See When We Read purports to be neither; it simply wants to be seen and discussed by as many and varying perspectives as possible. And if not everyone reads the whole thing, it matters not one whit. The whole thing can still be discussed, and enjoyment multiplied. Because, you see, it’s not exactly a book, it’s merely about them. And therefore about us too. —Purchase What We See When We Read, online, from Blue Heron Books.